Who: Drs. 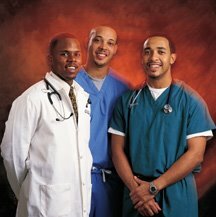 Sampson Davis, Remeck Hunt and George Jenkins, better known as the Three Doctors, a trio of motivational speakers from Newark, N.J., will be our Bless the Mic guests this month. Both Drs. Davis and Hunt have medical degrees, while Dr. Jenkins is a dentist. These childhood friends use their backgrounds and accomplishments to inspire others. Their books The Pact, The Bond, and We Beat the Streets will be sold during their presentations. Their main goal is to serve as positive role models for individuals who have faced any kind of hardship, capitalizing on “our children cannot aspire to be what they cannot see.” This semester’s speakers are co-sponsored by the Clinton School of Public Service. No tickets or reservations are required. When: Tuesday, Feb., 12, 2013; 7 p.m.